We were off to a fairly good start. With black out blinds in the bedroom and white noise blasting on the iPhone (habit, not necessity – we find it unbelievably quiet), our first night looked promising. Nonetheless, even in a new setting, my youngest managed to find his way to his true North (a.k.a. ME) and tiptoed into our bed at some point in the middle of the night. He’s a thrasher. A bit uncomfortable in a queen for my 6 ft tall hubby so he happily unfolded the queen pullout. We were all a bit groggy waking up, but I jumped out of bed and remembered I had an urgent mission. Getting the dog into the elevator, through the lobby and out the front entrance and making sure he knew the proper place to mark his territory. And so with paper towel in my backpack (please do NOT let me be that resident) we headed out. He sat in the elevator (no sniffing allowed), scurried down the corridor, through the lobby and made it out the door. Accident-free! I came back inside, head up, walking tall and proud. I was ready for my first shower. Water pressure was good. Temperature was good. But it was definitely small(er). I had been spoiled with my raincan and jets. I have to admit, no one was missing anything…yet. No toys had been pulled out and the TV had not even been turned on. Who needed cable when we had live sports right outside our window. From my perspective, it was a bit easier to have everyone so contained. No one upstairs. No one in the basement. Everyone within sight. Everyone within earshot. No hollering necessary. And we were ready to head out and start the day. We are getting used to the idea of carrying around a fob for common area access. Would it ever be easier if there was NFC (Near Field Communication) sensors that communicated with my cell phone to give me access. I would love not to have to fumble in my purse each time I was entering the building. (This is something that will be in our buildings that are currently under construction.) A really nice lady on the elevator noticed my fob (it’s hard to hide, being almost the size of an aero chocolate bar) and told me I could trade it in for a smaller one. On my to-do list. And by the, way, who says dense urban environments are isolated? Charles Montgomery does, actually. But I have to argue that. Already I’ve met two and a half of my neighbours (one beside me, one across and the half being baby Charlie at 6 months young). This is something that took me over a month to do in my single family home. It would have likely taken 3, had it been winter, when people hibernate and we tend not to see each other for months. The day ended far better than it began. I was feeling more settled. Feeling like I belonged. 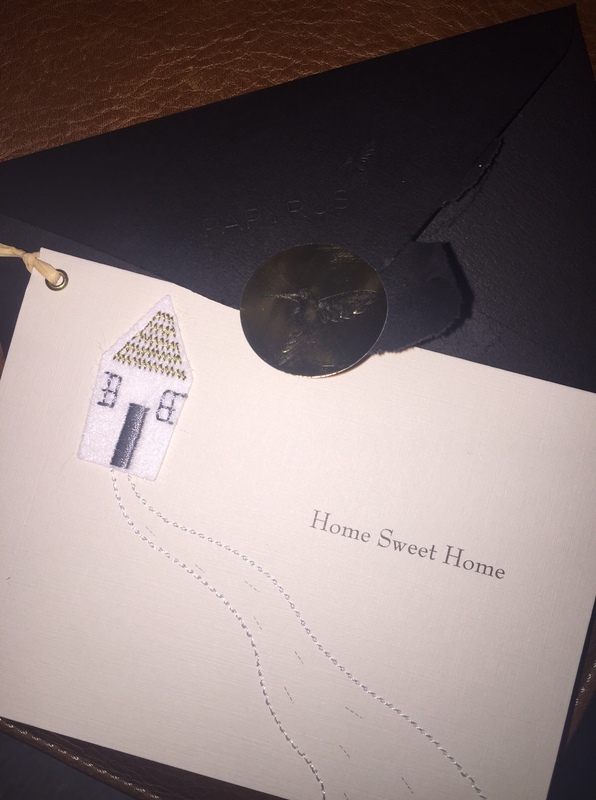 I returned “home” and found a little envelope on my bed. A small note of appreciation, support and of love. A reminder that home is wherever we are. One guess who it was from. Previous Post Day 2. Getting comfortable.